The objective of INTUITEL is to enhance state-of-the-art eLearning content and Learning Management Systems (LMS) with features that so far have been provided only by human tutors. An INTUITEL-enabled system constitutes an integrated learning environment that configures itself in response to any learner, monitors his/her progress and behaviour, combines these data with pedagogical and methodological knowledge and then by automated reasoning deduces optimal guidance and feedback. The INTUITEL project commenced October 2012 with funding from the European Commission Seventh Framework Programme over the next three years and co-financed by project Partners. INTUITEL will be executed as part of the Specific Programme on ‘Cooperation‘ , precisely, within ‘The ICT Work Programme’. The worldwide increase of knowledge has led to an information-based society, where a single individual is no longer capable of knowing and understanding a significant part of the available knowledge in a given field. Therefore, technology supported learning faces a huge increased complexity, a large possibility space that recently has been denoted as the “learning cloud”. Traditionally, it is the key task of a human tutor to reduce this complexity. The tutor balances teacher control and learner control, thereby providing conditions necessary for successful learning. However, the human tutor tasks are time consuming and it is not always possible to effectively support all the students. The INTUITEL system provides methods to automatically select and deliver those contents that better suits the learner needs, allowing a more effective learning experience. 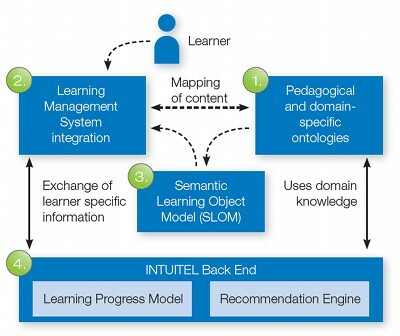 INTUITEL aims to create a rule based system of content and technology, where the knowledge of instructional design experts and knowledge domain experts is mapped into an ontology and rules in order to automatically reduce the complexity of the learning process decisions to a level suitable for the individual learner. Another goal of INTUITEL is the acquisition of methodological knowledge by the learner. By increasing the level of complexity during the learning process the learner will gain methodological knowledge about the learning process and about the knowledge domain. This concept can best be explained by an analogy to computer games: While playing, the player understands and reconstructs the rules of the game. The same happens in a learning environment where knowledge about learning methods and methodological knowledge about the knowledge domain is integrated into the logic of LMS. Learners will reconstruct the methods while learning. Furthermore, the deductive process may include the current learner performance, the daily learning attitude and emotional setting of the learner, personal aspects like gender, culture and age as well as environmental aspects like available communication bandwidth, ambient noise level, screen size and type of access device. INTUITEL therefore will be a step towards a global learning cloud, where personalized technology-supported learning is available for any person at any place, with any access device and under any external condition. The project is broken down into work packages (WPs) with each contractor having a clearly defined role. 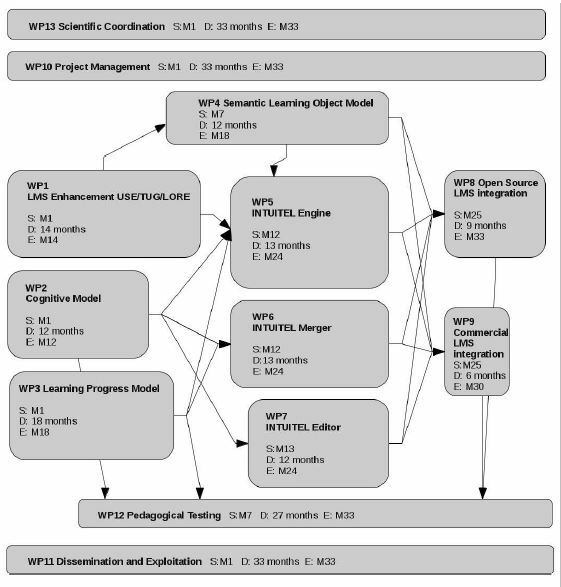 WP4: Development of the Semantic Learning Object Model (SLOM) which is responsible for the semantic enhancement of learning content by pedagogical and factual metadata. WP5: Development of the INTUITEL Engine, which uses the learner data and the content metadata to perform the recommendations according to the system rules. From the technical point of view, this is the core part of the whole system. WP6: Development of the INTUITEL Merger. This software merges different SLOM objects into new ones, and therefore plays an important role in the interoperability of INTUITEL enhanced learning packages. The merger is the main contribution of UNIR within the project. WP7: Delivering the INTUITEL Editor, a tool to connect learning materials with metadata, so that the Engine is able to properly select the most relevant content for each situation. WP9: For the commercial version.